When the page contains both qualities with regular frame rate and high frame rate, this option controls which set of qualities to use. Note, quality is selected only after video resolution comparison. So if preferred resolution does not have high frame rate, and some other resolution has it, then still the preferred resolution will be chosen. In quality description the video with high frame rate is appended with 'HFR' string. When the page contains both qualities with regular video and high dynamic range video (HDR), this option controls which set of qualities to use. Note, quality is selected only after video resolution comparison. So if preferred resolution does not have high dynamic range, and some other resolution has it, then still the preferred resolution will be chosen. In quality description the video with high dynamic range is appended with 'HDR' string. Which audio quality to prefer in video. Takes action after video quality comparison and only if more than one audio quality meets selected audio criteria. Option value Auto means select bitrate appropriate for specific video resolution. Depending on resolution it will be set to next value: 144p: 48 kbps, 240p: 64 kbps, 360p-480p: 128 kbps, 720p: 256 kbps, 1080p+: 384 kbps. Best audio is M4A. According to default value of Muxing exceptions option it is not compatible with WebM and can be selected only for MP4. 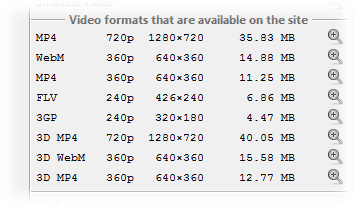 Therefore full MP4 quality is 1080p+127kbps when WebM is 1080p+102kbps. That is why MP4 becomes selected. List of formats to be ignored at analysis. So they will never be selected for download automatically. Manually (via Formats combo box) it is still possible to use them. Format in context of this option means file extension like it is shown in Formats combo box. To enter several formats separate them by semicolon. When audio formats are entered e.g. ogg;opus, they will be ignored when downloading audio. If you want to ignore some audio as part of the video, pretend it with '+' character e.g. +m4a;+ogg. Using this option you can specify preferred formats. Unless Format takes precedence over quality is checked, this option takes action only if there need to compare two media files with the same quality. To enter several formats separate them by semicolon e.g. formatspec1;formatspec2. In case of audio formatspec is just format name (e.g. opus). In case of video formatspec is either video format name (e.g. mp4) or formats pair (video+audio). In the latter case one of two parts can be omitted (retaining '+' character). Also in this case VO video should be specified explicitly (by appending format with '-vo' string). By default, when two formats are compared, Priority of formats is used only after quality comparison. Thus it is used only when qualities of video and audio streams are equal. This is not the way how some people may expect or would like it to work. This option changes comparison workflow part described above. When it is checked, formats entered in Priority of formats will be selected regardless of their quality. If option is checked and page contains adaptive audio streams then only they will be used when selecting audio stream for video or for single audio download. If option is unchecked then audio which can be extracted from usual video clip will also be used in the comparison. File size of the file containing original audio in this case matters only to comparison of two audio with the same quality. For example if you need 192 kbps audio and page contains video with this audio bitrate but no adaptive stream with 192 kpbs then audio from the usual video clip will be used no matter if page contains other adaptive audio streams. When need to download video file and the clip page contains adaptive streams, program creates combination of every video and audio stream that it finds. Resulting 'pseudo' file then is used in comparison like any other video file. Not every video and audio stream can be muxed together. This possibility depends on media file format and codecs of the video and audio stream. For example, WebM is not designed to store AAC streams, Opus is not currently supported by MP4 container etc. So some streams combinations should be avoided. This option contains pairs of formats which should not be muxed together. Expected option value is format1+format2, for example mp4+ogg. To enter several pairs separate them by semicolon. Youtube and Dailymotion clips can have external subtitles. More about this you can read on Subtitles support page. Using this option can be selected any set of subtitles. For every kind of subtitles can be selected its own set. Subtitle becomes selected if its language tag contains any of language tags specified within these options. 'Contains' means substring match, case-sensitive. Language tag has strict format so Add button will remain disabled until it is properly entered. It is required to have language code and optional script and country codes separated by hyphen. Country code and first letter of script code should be uppercase, all other lowercase. When the clip contains both 3D and non-3D variants of the video (and only in this case), this option controls which set of videos to use. And will be used only first three qualities (stated as 3D). In this case will be used first five qualities, all 3D qualities will be ignored. This setting was significant in the past. However at this time it looks like there are no more clips containing both 3D and non-3D video on Youtube. In quality description 3D videos are appended with '3D' string.